You are here: Home / Ent. / The Video Store: Ong-Bak. 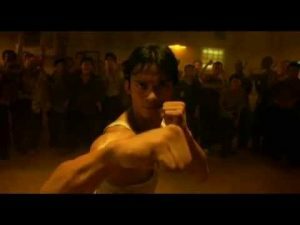 (ThyBlackMan.com) Tony Jaa is an actor that came to my attention with Ong-Bak: Muay Thai Warrior. The commercials for the film picked all the juicy parts of the film, all the awesome stunts that Jaa performed himself and it sold me on it. I should’ve been tasked with promoting the film but who would’ve said “Sure, let’s let this 18-year old handle the promotion. What’s the worst that could happen?” I’ll tell you who wouldn’t: whoever said Dragon Ball Evolution was an awesome idea. But this isn’t about Dragon Ball Evolution, it’s about the first Ong-Bak! Now, Ong-Bak isn’t a dramatic, life affirming film. You’re not going to walk away with any nuggets of wisdom or have an epiphany. Scratch that. If you’re looking to become a stunt person or actor in action films, Ong-Bak might prove to be an epiphany. I’m giving it a 60-percent chance of a realization happening. No, this is an action film in the purest sense. There’s just enough story there to keep the film from being what called a million-dollar, one hour and 40-minute stunt reel. The story is basically a lengthy retrieval quest. Thieves arrive in Ting’s (Jaa) village, steal the head of a valuable Buddha statue and head back to Bangkok. Ting is tasked with recovering the head sets out for the big city. He is basically out of his element but runs into his cousin, now going by the name George. His cousin is familiar with the ways of Bangkok and assists him on his quest. What Ting does know, is fighting and the scores of street toughs are just fed to Ting throughout. Ong-Bak’s fight scenes are just amazing. If I could use the chef kiss gif from The Simpsons, I would. The thing with the fight scenes is that they are just high impact, brutal, and natural. Jaa sets up these fights to take place in streets and alleys for the most part and combat rakes advantage of everything in realistic way. While I do enjoy some wirefu films and I love old school kung fu and wuxia, that hyper physicality isn’t there for the most part. Ong-Bak gave me that throughout. The other shining point of this film is Mum Jokmok’s comedy relief. He does a great job at giving levity in what could’ve been a really serious film. Jaa’s character is very serious and determined so he’s not got crack wise with one-liners or anything. Mum Jokmok was there to round out Jaa and it worked. Finally, the pace. Like I said, there’s just enough story to serve as glue for the film. Ong-Bak wasn’t bogged down by too much drama or a lot of exposition. We don’t even know much about Ting other than he is his village’s best fighter and has a cousin who left the village earlier. And you know what? That’s all I need in an action film. I can’t really find fault with Ong-Bak. Savvier moviegoers might point to a “weak story” or “one dimensional characters” but I’m good with that. I’m main complaint about the movie is that there was no sequel. The film had two prequels which is fine but I wanted further adventures with Ting. Other than that, this was film that kneed and elbowed every spot I seek in an action/martial arts movie. If you want a film to just sit and enjoy without feeling the need to break it down for deeper meaning, Ong-Bak is it.